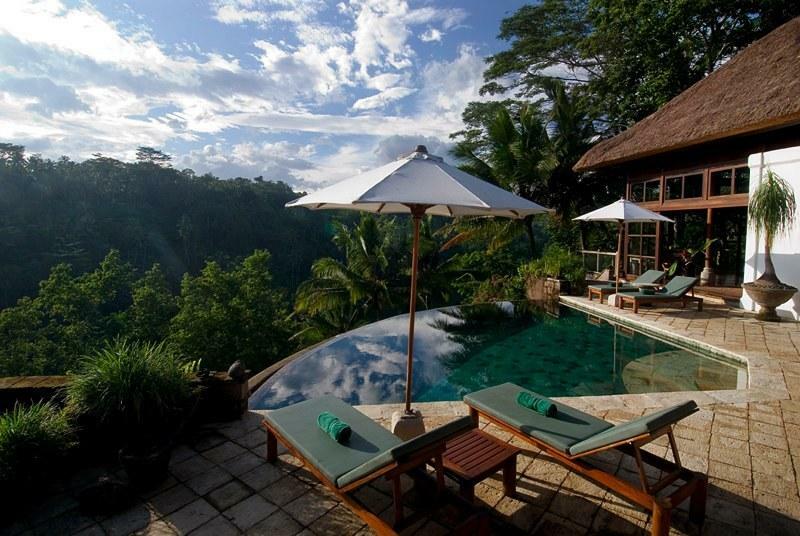 The enchanting Villa 399 is perched upon the Sayan Ridge in the traditional Balinese village of Kedewatan, just five minutes drive from the cultural town of Ubud. 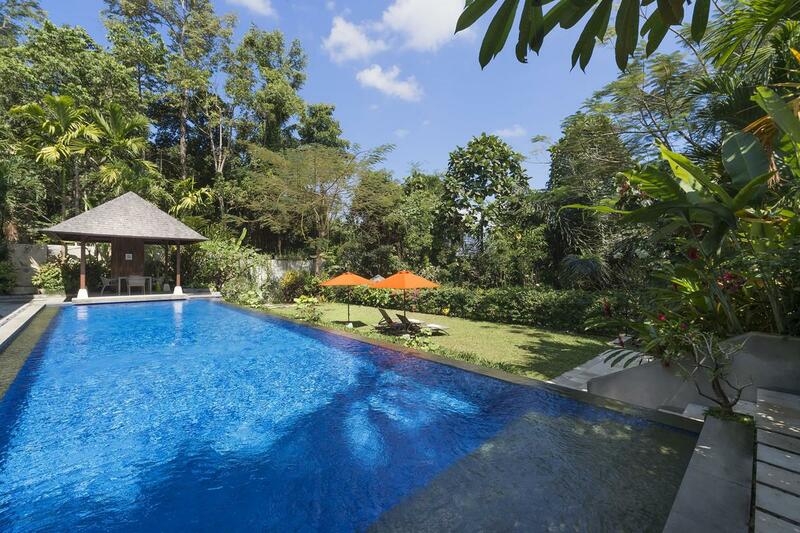 Providing accommodation for up to 8 adults, the villa is available for short and medium-term rental, whenever the owners are not in residence. 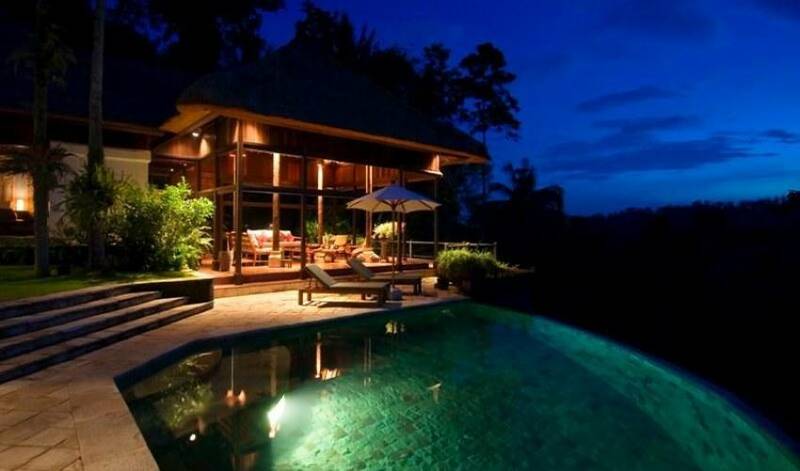 The style is elegant and romantic, presenting tropical living at its very best. 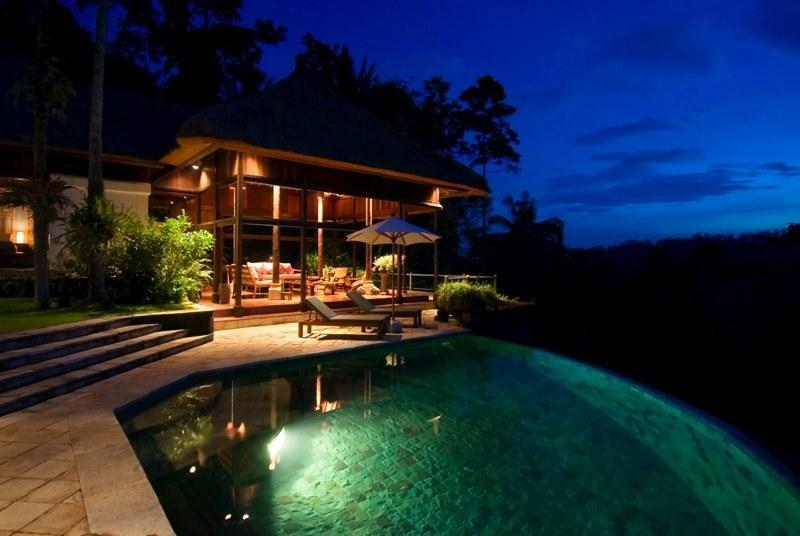 The graceful architecture of this thatched hideaway is essentially Balinese. The property is constructed of traditional local materials, with contemporary style incorporated into the high-quality fixtures and fittings. Designed to harmonise with the environment, the pavilions and viewing balconies offer a blend of open-air living and air-conditioned comfort. The colonial-style furniture is complemented by traditional batik fabrics and antique artefacts, while the 5000 square metres of terraced gardens incorporate a delightful lookout pavilion, a converted rice barn, and a water-garden of cascading ornamental pools. 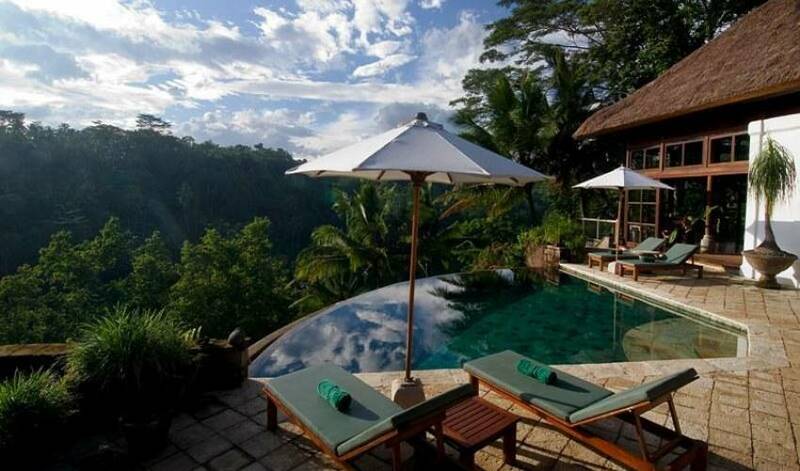 The approach, via an 80-metre driveway, offers no clue to the exceptional design of the villa or the awesome view. From a spacious private parking area, 82 stone steps lead down to the main entrance, via a wooden bridge over a narrow creek. Alternatively, the press of a button summons a rack-and-pinion funicular lift, which carries 4-5 people and is always available when the steps are too daunting. It is this secluded setting, way back from the road, which makes the house unique. With no traffic noise, the only sounds are those of nature and the rushing of the river; there is not a neighbour in sight! Linked to the south bedroom, the breezy living pavilion is open on three sides, with direct access to the stone pool deck. This ample lounge presents a high roof supported by coconut wood pillars above a terracotta tiled floor. It is furnished with comfortable cushioned daybeds, lazy chairs, and an antique coffee table. It is also equipped with a quality music system with CD or MP3 capability, surround-sound speakers in the ceiling, reading lamps and a built-in wall desk with broadband Internet access. Cantilevered to one side of the pavilion is a sunny viewing balcony, with a broad wooden deck that juts out over the tumbling gardens. The spacious dining pavilion is linked to the north bedroom, and is characterised by floor-to-ceiling glass doors and windows, which can be opened up to allow the cool breezes to permeate. Fitted with a ceiling fan, the room is dominated by a solid teak dining table for eight. The well-equipped open-plan kitchen, with its serving counter, is located to one side; this is where the staff will prepare delicious meals. The pavilion is complemented by a large alfresco dining balcony with an outdoor table. Leading off the dining room is a guest washroom with a shower, a sculptured granite washbasin, and a separate toilet. A staircase ascends to a fan-cooled, timber-floored mezzanine furnished with a pair of twin beds, an antique storage chest, and a large desk with a phone, an Internet connection, and a direct view into the river valley below. The two identical master bedrooms are positioned at ground level. Each is air-conditioned with the additional provision of a ceiling fan. Ubud’s relatively cool climate, combined with the soaring roofs, means that the ceiling fans are often quite sufficient for guests’ needs. Each of these bedrooms features a custom-made king size bed, an en-suite bathroom, and an adjoining walk-in dressing room, complete with cupboards, hanging space and full-length mirrors. 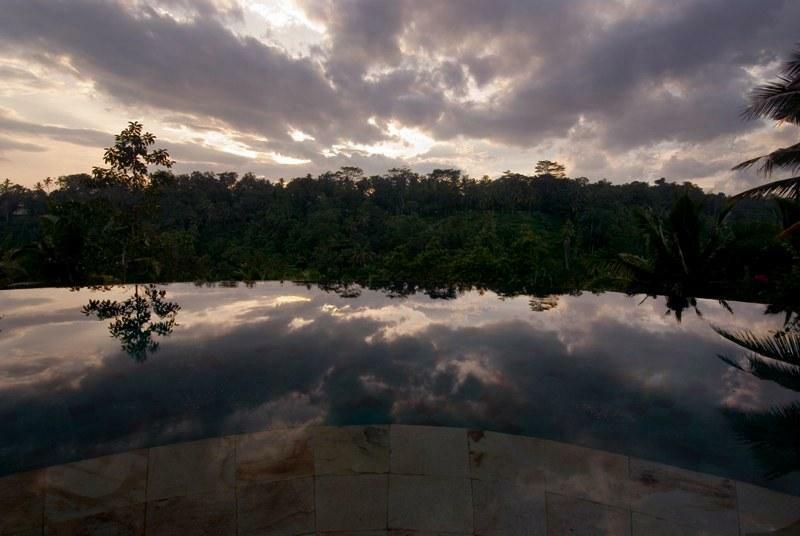 When the large sliding doors at the front of each bedroom are opened, the pool, garden, and rainforest appears and the interior becomes one with nature. The picture is completed with attractive furnishings, local artefacts, oriental rugs and an ornately-carved antique Javanese door-panel behind each bed. Each of the bathrooms is embellished with a small tropical garden, surrounded by a wall for privacy. Each features a pebbled floor with timber decking, rough tumble marble wall tiles, ‘his n hers’ double rainshowers, twin washbasins, a toilet, and a thoughtful array of bathroom amenities. The owners have converted a genuine antique Balinese rice barn into a cosy snug, reminiscent of a grass-roofed tree-house and accessed by wooden steps. Air-conditioned and also fitted with a ceiling fan, the lower floor is an entertainment room, equipped with a satellite TV, DVD/Video player, kilim floor cushions and a Persian rug, while a wooden ladder leads up to a romantic sleeping loft for two. Below, is the barn’s funky cave bathroom, which is reached by a flight of steps. Open on one side and bordered by river stones and a random rock wall, the cave is lined with marble and fitted with a shower, toilet and washbasin. 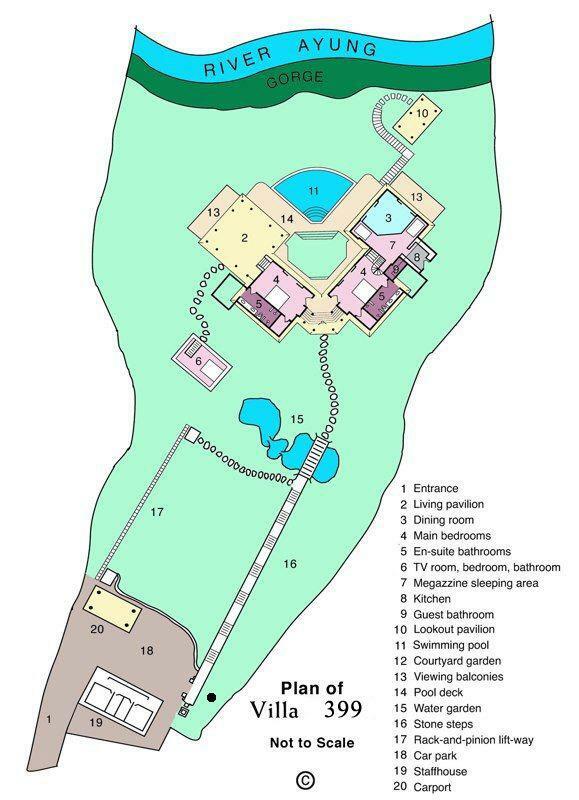 This is ideally suited to younger people, due to the steps up and down between the sleeping area and the bathroom. A winding stone stairway meanders down through the garden to a thatched ‘sakenam’ relaxation pavilion, positioned upon a ledge overhanging the river valley with a magnificent vista of the rice fields and distant volcanoes. Fringed by the forest, with its two raised platforms strewn with cushions, the pavilion is a charming collectors’ piece showcasing ornate woodcarvings. This is a wonderful spot for enjoying a hearty breakfast, or simply daydreaming and absorbing the natural surroundings, while being lulled by the ceaseless gurgle of the river as it coils its way through the chasm below. At night Villa 399 takes on a different persona. 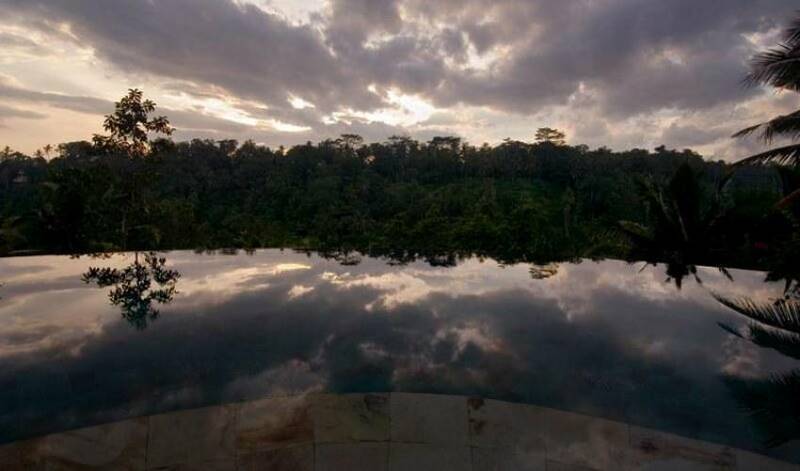 As the chirruping cicadas finish their day shift, guests will be serenaded by a chorus of frog song to the accompaniment of ritual music from distant village temples. With the night sky unsullied by streetlights, it is pure joy to sit in this pavilion and watch the fireflies. 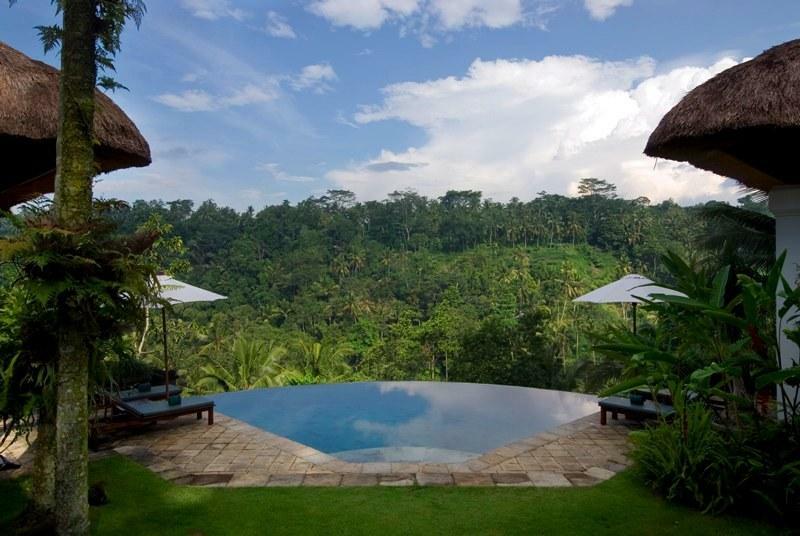 Villa 399 is situated on the Sayan Ridge on the outskirts of Ubud, one hour’s drive from Denpasar's 'Ngurah Rai' international airport, 40 minutes from the coast, and convenient for tours all over the island. The setting, 300 metres above sea level in the foothills of the central mountain range, presents a fresher, more pleasant climate than the southern coastal regions. 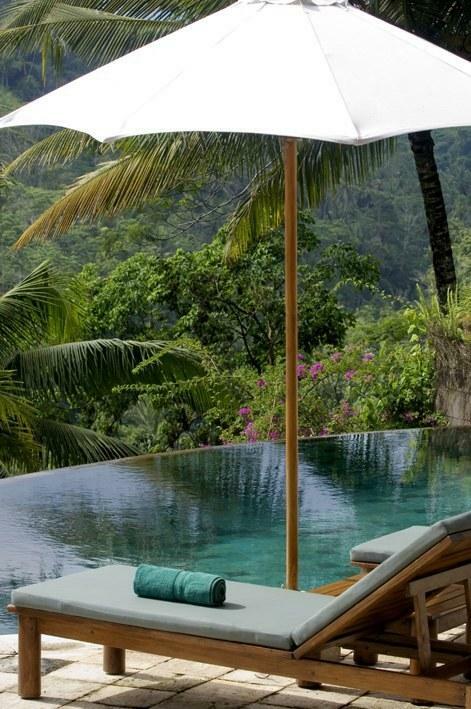 The Sayan Ridge is also the dramatic location of some of the Island’s most luxurious boutique hotels, including Four Seasons and Amandari. 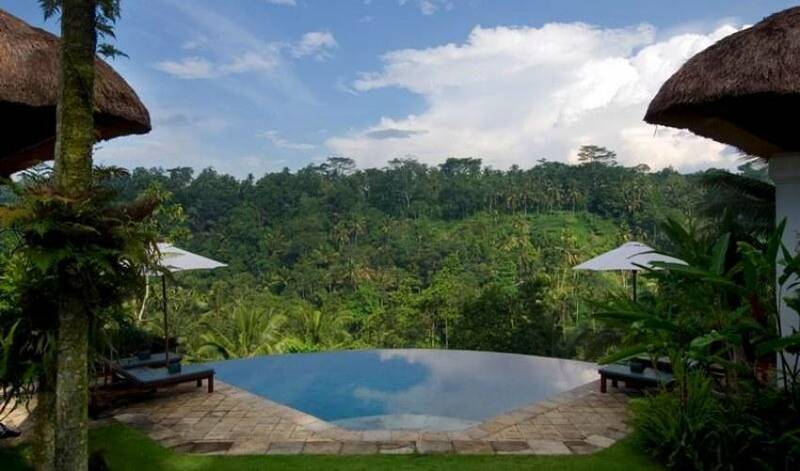 The remarkable town of Ubud is Bali’s centre for fine arts and cultural performances, and the surrounding villages are home to many highly-accomplished Balinese painters, dancers, musicians and carvers. 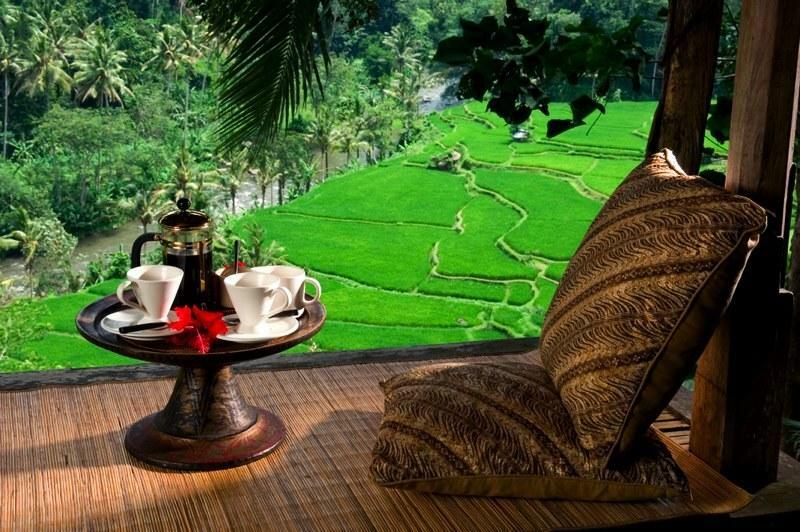 Ubud was originally an important source of medicinal herbs and plants. In fact, the name is derived from the Balinese word for medicine. Ever since the German artist, Walter Spies, settled here in the 1930s, the town has been a magnet for writers, art collectors, connoisseurs, mystics, and people actively involved in art, anthropology, music, dance, architecture, environmentalism and alternative healing. The area is encompassed by most of the features that draw people to this unique and beautiful island – gorgeous scenery dotted with ancient temples and palaces. 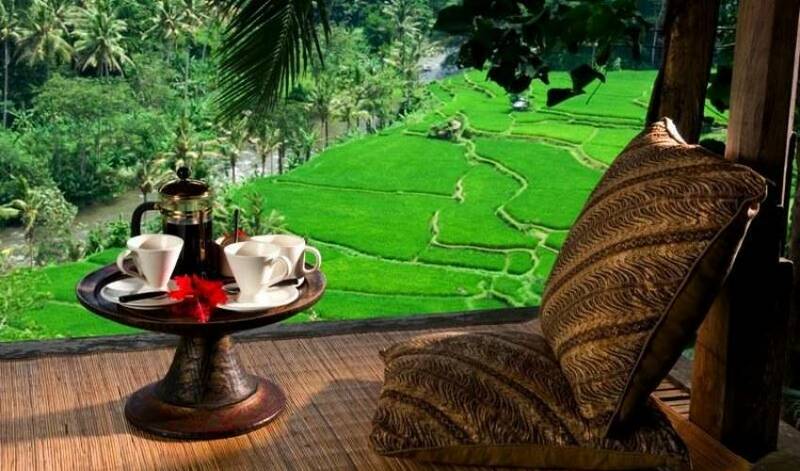 Ubud’s visitors are those in search of culture, nature and inspiration. 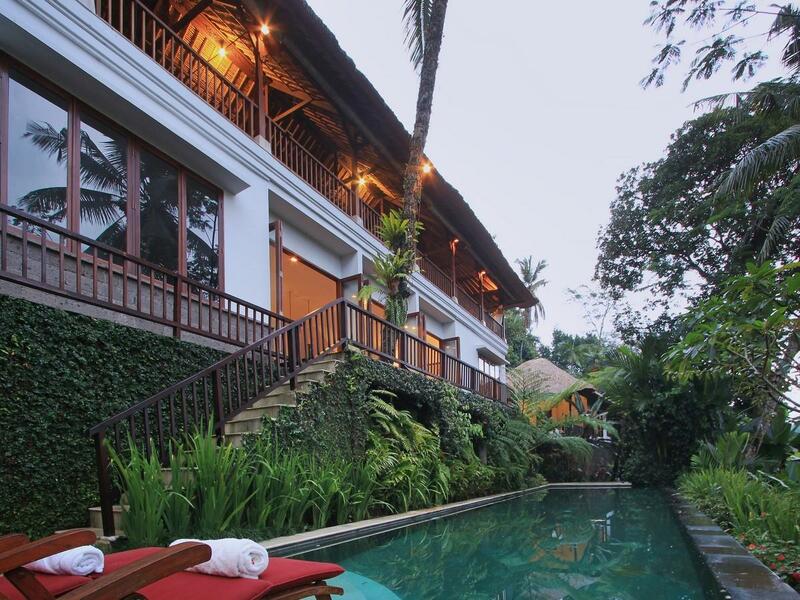 Ubud boasts plenty of restaurants, in addition to some sumptuous spas. It is also a great place for shopping. The shops and the market stalls sell handicrafts, gold, silver, jewellery, woodcarvings, fabrics, clothing, pottery, batik, paintings, metalwork, and antiques. There are many, well-presented, cultural performances staged in the town, in particular the Hindu epic, the Ramayana; also the Kecak dance, the fire dance, the monkey dance and the Legong dance. An abundance of museums and art galleries around the town feature traditional and modern work including paintings, ceramics, carvings, sculpture, batik, weaving and photography. The market is open everyday selling handicrafts, garments, spices and foods. The blissful serenity of Villa 399 makes it the perfect retreat for an artist or writer who is looking for peace and inspiration, or quite simply a tranquil haven for those who wish to chill out. 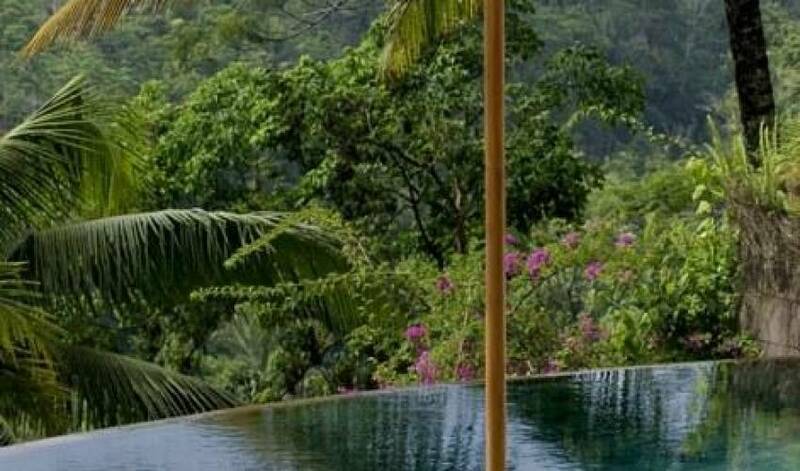 The location is ideal for total relaxation or activities such as meditation, yoga, jungle trekking, mountain cycling and white water rafting. Guests will appreciate the cool air, and in the mornings they will awake to the sound of the dawn chorus. The area is a birdwatchers paradise and as the jungle comes to life the iridescent blue Java Kingfisher with its distinctive red beak is not an uncommon sight. Numerous trails offer memorable walks, and visitors will be presented with a privileged insight into the traditions of rural Bali, as they witness time-honoured methods of agriculture and taste the produce of the land. Villa 399’s caring staff, with their profound knowledge of the locale, will fulfill their duties with enthusiasm and smiles. 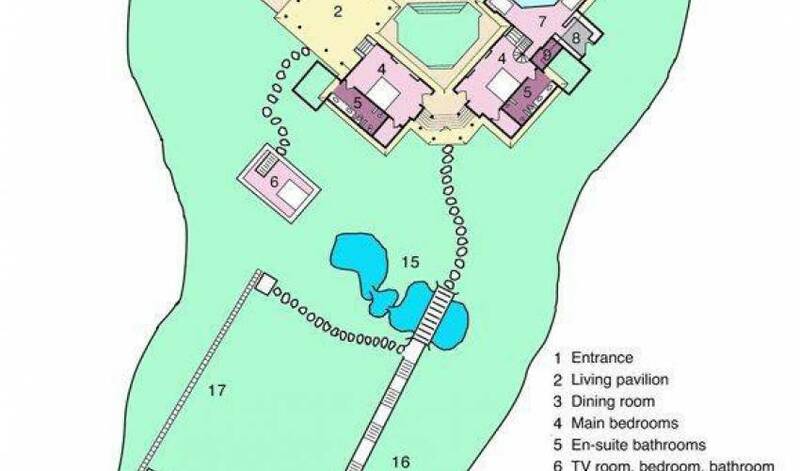 Separate from the main villa, is the service area and quarters of the resident staff-members, who maintain the property, look after the houseguests and ensure the security of the premises. Dayu , the Villa Supervisor, who is also the Chef and the Housekeeper. Dayu oversees the staff andproperty and is available to assist guests during their stay. Trained in the preparation of both local and international cuisine, she will coordinate all of the market shopping. Ida Bagus , the Assistant Supervisor. He is also the Driver. Nyoman , Dayu's assistant, is responsible for housekeeping duties and daily laundry. Kadek , the Gardener, tends the grounds and maintains the swimming pool. Dewa , the night watchman, guards the villa and ensures the security of the guests. Nona is the beautiful Golden Retriever who lives at the villa. She is very gentle and is looked after by the staff. Upon request, it is possible to arrange for her to be taken elsewhere during a guest's stay. A 4-6 seater minivan is based at the villa, and is available for rent by the villa's guests, either as self-drive or with a driver. (An INTERNATIONAL Drivers Licence from country of origin, or an ASEAN member country's licence, is required by Indonesian law). A baby-cot or a child’s bed can be provided on request. Meals: breakfast is provided free of charge on the first morning only. Thereafter, breakfast and any other meals can be provided according to guests’ wishes, and provisions for these can be obtained by staff at guests’ expense. There is also a menu, with a variety of Indonesian selections, and some simple international dishes, with all items charged at cost of ingredients. The villa also stocks some wines. 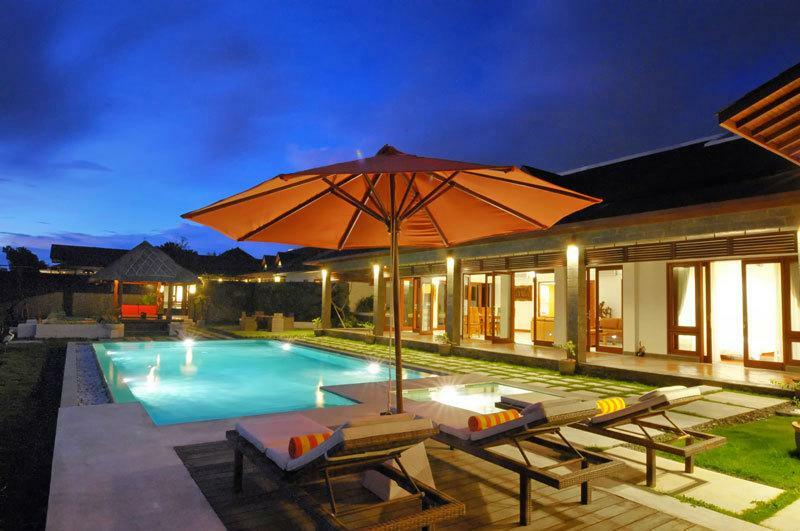 Villa Melati is a 5-minute drive from the centre of Ubud, where there is a wide choice of restaurants and other facilities. Ubud shuttle: free transfers to and from anywhere in Ubud are provided at any time by prior arrangement, using the villa’s minivan.